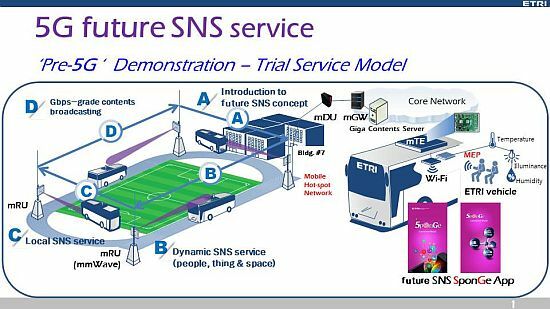 Daejeon, Korea, Dec 17, 2015 - (ACN Newswire) - A 5G future is no longer a distant one, but an upcoming reality. High quality videos of more than 10Mbps can be served simultaneously to 100 users even in a train running at up to 500km/h. People can experience data rates that are 100 times faster than currently available technologies. Recently, as a global ICT leader, ETRI has been advancing communication and convergence by developing Ship Area Network technology, Genie Talk (world class portable automatic interpretation; Korean-English/Japanese/Chinese), and automated valet parking technology. As of 2015, ETRI has about 2,000 employees where about 1,800 of them are researchers. For more informatoin, please visit www.etri.re.kr/kor/main/main.etri.